Mount Panorama (ミハラシ山 Miharashi Yama) is a mountain to the west of Unwavering Forest in File Island. Mount Panorama is a mountain to the west of Unwavering Forest which leads to Gear Savannah. However, its main route from Unwavering Forest is cut off by a landslide, so an alternative way would be to dig a tunnel through Drill Tunnel's Lava Cave to get to the Panorama Area of Mount Panorama. Part of Mount Panorama is a growing spot for many spores, which may cause some Digimon to get injured. Panorama Platform offers a great view over Gear Savannah, and is the perfect place to take morning jogs. First appeared in "Red Hot! Birdramon", Mount Panorama is known for its spring water, which flows to the Pyocomon Village. Meramon lives here, and acts as its protector, as it is the sole water source of Pyocomon Village. Reports have said that an injured Digimon can be found at the entrance of Mount Panorama's Spore Area, who requires recovery from friendly travelers. 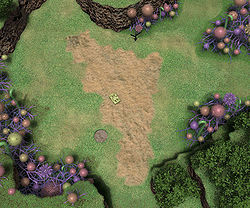 Also, news report that strange crop circles are found to the east road in the Spore Area... aliens, perhaps? Also, a few reports say that a small-sized Digimon can sometimes be found walking around the Panorama Platform, looking for someone to fight. Only spectators were able to confirm the Digimon, as those who have challenged this Digimon have been defeated. First appeared in the episode "Red Hot! Birdramon" (灼熱！バードラモン Shakunetsu! Bādoramon), Mount Panorama can be seen on the background of Pyocomon Village.